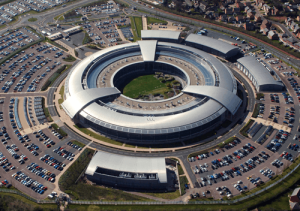 The UK’s “spy agency” the GCHQ has had a rough ride over the past few years due to the Edward Snowden revelations. Once the darling institute of the UK in wartime Britain, tasked with with breaking the Enigma code used by the Nazi party for communications it has somewhat become a love to hate institution. On one hand tasked with protecting the UK population, on the other tangled up within the complicated web of mass surveillance and what that entails. Sir Iain Lobban who up until recently was the director of GCHQ has stepped down from heading the organisation in a meeting with other former GCHQ heads and assorted spy types that included the current head of MI6. Governments, especially those who find themselves in one of Five Eyes countries (USA, Canada, UK, Australia & New Zealand) face the challenge of protection of the public while having the finger of suspicion pointed at the various spy agencies due to the ways in which we know they carry out their intelligence gathering. Thanks to Edward Snowden we are now aware how organisations such as the GCHQ operate, how we should protect our online privacy and the way in which they mass vacuum information that isn’t required to find what they require. As has been stated by others, the information is merely hay and they are looking for needles, not at the surrounding hay. This ethos does not sit comfortably with the majority of the online world, however the response from the UK public has been somewhat more subdued than that of other countries with only specific groups and organisations taking up the argument surrounding mass surveillance. The role of agencies such as GCHQ has become a double edged sword situation, their whole purpose and operation is to operate in secrecy, but with secrecy and the revelations of the likes of Edward Snowden any such claims about what they store, have access to and can achieve, will be met with scepticism. What the individual believes is personal preference, however the closing comments of Lobban certainly give pause for thought in what we expect the agencies tasked with protecting us do and how they go about that.